It is a collection of JAR files which represents specific release of the jBPM project JARs. Download the binary distribution of jBPM. Unzip it on the local file system. Give the path in the Eclipse IDE. 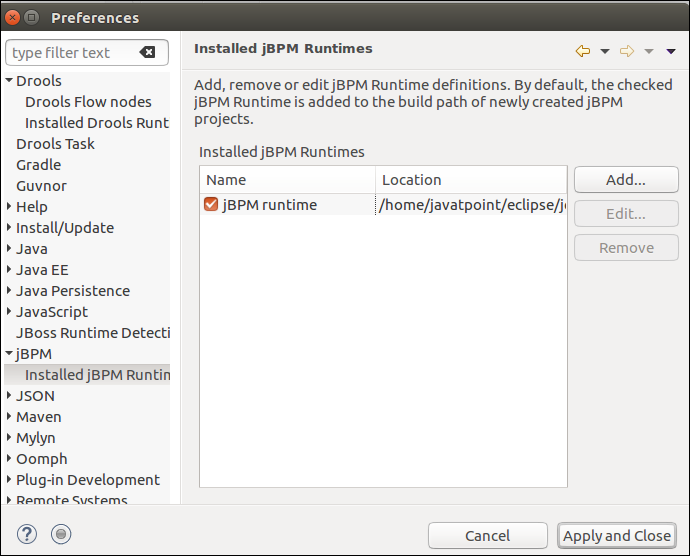 We can also define jBPM Runtime by using Eclipse Preference view. 1. Go to Wndows -> Preferences -> Click jBPM -> Select Installed jBPM Runtime. 2. Click on Add Button. Type a unique name for the Runtime and give the location on file system where it can be found. 3. Click the Browse Button, select the folder which contains all the required JARs and click OK to register the Runtime. 4. If we want to use default JAR files click on "Create a new jBPM runtime" Button and select the folder on the file system where we want to create a runtime then click OK to register this Runtime. This will copy all the required dependencies for our project. 5. Now select the CheckBox of jBPM Runtime and click on Apply and Close Button.